Living on a bare bones budget? 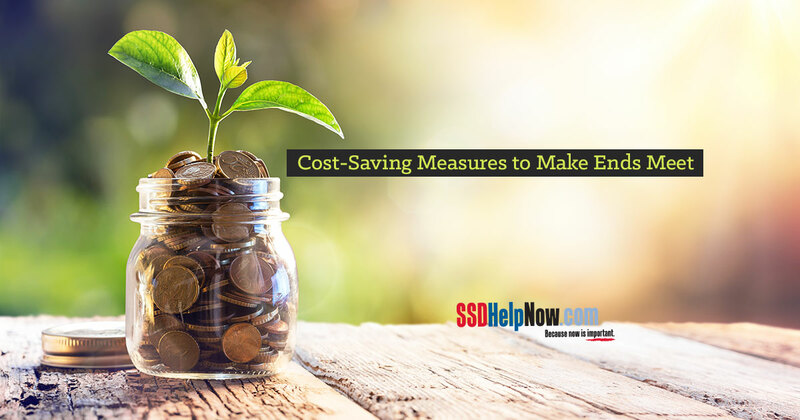 These cost saving measures may help you make ends meet. For many, barely scraping by is a way of life. This can be especially true for people who are unable work due to a severe physical or mental condition. Medical bills coupled with limited income can take cost saving measures to a whole new level. We aren’t talking about foregoing a daily latte or canceling a subscription to Netflix. Individuals coping with illness and injury are often one step away from having their utilities cut off or eviction. If you are struggling to pay bills or put food on the table, help is available. One of the easiest ways to find it is by calling 2-1-1. This simple action can connect you to programs and resources in your community, including food pantries, transportation, and help paying utility bills. 2-1-1 is a free, confidential helpline that connects people throughout the country to critical resources 24 hours a day, seven days a week. You can also seek assistance by visiting the 2-1-1 website. Save your pennies ― literally. Start a change jar and diligently put loose coins in it. At the end of the month, cash them in at your bank. You may also be able to cash them in at a coin-counting machine in your local grocery store, but be sure to check whether there is a fee. Some coin-counting machines take a percentage if you take cash, but may give you 100 percent if you put it into a gift card. You won’t get rich off the money you collect, but every little bit helps. Take three to five minute showers. Think of a long, hot shower as money down the drain. The average American shower uses 17.2 gallons of water and lasts 8.2. minutes long. Not only will cutting back save on your water bill, but it will also cut back on your energy bill since it takes electricity or gas to heat the water. A quick shower is a cheap shower. Using coupons to buy groceries and toiletries can save a lot of money. Although the savings per coupon may be small, they definitely add up. It’s important to exercise some caution if you use coupons. Don’t buy something just because you have a coupon. Compare the cost of the couponed item with a generic brand. Often times, the generic brand is still cheaper. And always, shop the sales. Food is expensive, so if you find something at its lowest price try and stock up. Rice, pasta, and beans are cheap, store easily and make filling meals for a family. If you buy in bulk, you get a cheaper price per unit. Cancel cable and rent books and movies at your local library. If you are pinching pennies, you have probably already done away with cable TV. (If not, well, it’s probably high time to get rid of the cable bill). Instead of watching cable television, rent books and movies at your local library. It’s free and you might be surprised by the selection. One way to get something you and your family need for free is to trade services with someone. Bartering was popular during the Great Depression, but there is no reason not to utilize this cost-saving technique today. Exchange services or products with someone in a similar position. Perhaps an able-bodied family member can babysit, pet-sit, or tutor for a friend, relative or neighbor in exchange for something your family needs, such as haircuts or yard work. Seek Social Security Disability benefits. If you cannot work due to a medical condition, you and your family members may be entitled to Social Security Disability benefits. The Social Security Administration manages two federal Disability programs: Social Security Disability Insurance (SSDI) and Supplemental Security Income (SSI). Both programs offer monthly cash benefits to disabled individuals, but they are actually quite different. To find out if you may qualify for either program, contact the Disability team at McDonald Law Firm. We would be glad to evaluate your circumstances for free, complete your application, and handle your claim from start to finish. Our services will not cost you a penny up-front. Call us today to learn more at 877-568-8413. We hope you found this information on cost saving helpful. Living on a low-income budget is tough. No one understands this better than the disability attorneys at McDonald Law Firm. Each day, we help disabled people in dire financial straits get the monetary benefits they need. We can help you, too. Contact us today at 877-568-8413.